Residents near big solar projects are often concerned they cause glare and noise. Many of us are familiar with developments of big solar farms in rural and regional areas. These are often welcomed as a positive sign of our transition towards a low-carbon economy. But do large-scale solar installations have a place in our cities? The City of Fremantle in Western Australia is considering a proposal to use a former landfill site for a large-scale solar farm. The reportedly 4.9 megawatt solar power station on an eight-hectare site would be, it’s said, Australia’s largest urban solar farm. The initiative is part of Fremantle’s ambition to be powered by 100% clean energy within a decade. The proposal is facing some community opposition, however. Residents are reportedly alarmed by the potential public health consequences of building on a rubbish dump, which risks releasing toxic contaminants such as asbestos into the environment. Other concerns include glare from the solar panels, or excessive noise. Similar complaints about solar panels in cities are being seen all over the world, with opponents generally of the view “they do not belong in residential areas”. So what are the planning issues associated with large-scale solar installations in cities? And should we be concerned about possible negative impacts? According to the Australian Clean Energy Regulator, large-scale solar refers to “a device with a kilowatt (kW) rating of more than 100 kilowatts”. A kilowatt is a measure of power – the rate of energy delivery at a given moment – whereas a kilowatt-hour (kWh) is a measure of the total energy produced (so a 100kW device operating for one hour would produce 100kWh of electricity). Device here refers to not only the photovoltaic (PV) panels – the actual panels used in solar energy – but also to the infrastructure “behind the electricity meter”. So interconnected panels may still constitute a single device. By this definition, there may already be large-scale solar installations in Australian cities. In Sydney for example, the recently opened system on top of the Alexandra Canal Transport Depot is by all accounts a large-scale solar system. It combines around 1,600 solar panels with enough battery storage for 500kWh of electricity. But this is not Sydney’s largest solar installation. That honour is presently held by the Sydney Markets in Flemington, among Australia’s largest rooftop solar installations, which generates around 3 megawatts (that’s 3,000kW). To date, there have been no publicly disclosed complaints received about these facilities. Large-scale solar (sometimes called “big solar”) can also refer to solar arrays that use mirrors to concentrate sunlight onto solar PV panels. This is different to concentrated thermal solar, which uses mirrors to focus sunlight onto the top of a tower to heat salt, oil or other materials that can then be used to generate steam to power turbines for electricity generation. What’s the problem with solar in cities? Internationally, there is increasing recognition cities could be ideal locations for large-scale solar installations due to the amounts of unused land. This includes land alongside freeways and main roads, flood-prone land, and rooftops on factories, warehouses and residences. And locating big solar in cities can also reduce the energy losses that occur with transmitting electricity over long distances. Australia’s combined rooftop solar installations already supply the equivalent of enough power for all the homes in Sydney. And even former landfill sites – which have few uses other than parkland and are often too contaminated to sustain other land uses such as residential development – can be a good use of space for solar farms. But such sites would need to be carefully managed so contaminants are not released during construction. 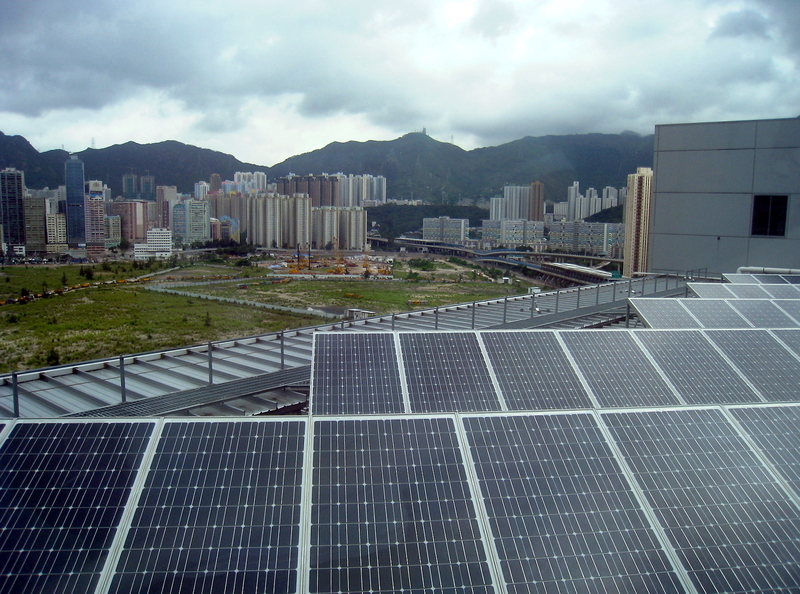 Large-scale solar installations can present some challenges for urban planning. For instance, mirrors can cause problems with glare, or even damage if they were misaligned (problems thus far have been in solar thermal plants). Maintenance vehicles may increase traffic in neighbourhoods. Installing solar panels could cause temporary problems with noise and lighting. And views could potentially be disrupted if adjoining residents overlook a large-scale solar installation. But not all of these impacts would be long-term, and they can all potentially be managed through planning approval, permitting processes and development conditions. Installing screens or trees can improve views, for instance. Glare is a potential problem but again can be managed via screening (at the site or on overlooking buildings) or protective films on the panels. The issue with the proposed solar farm in Fremantle is the fact it’s planned atop a former landfill site, known to contain harmful substances including asbestos, hydrocarbons and heavy metals. Unless carefully managed, construction of the solar farm could disturb these materials and potentially expose nearby residents to health impacts. Most state environmental protection agencies recognise risks if the use of potentially contaminated land is to be changed, and have developed stringent guidelines for landfill management. The Algarve Lagos solar farm in Portugal shows how empty land in cities can be used to host energy efficiency platforms. The City of Fremantle has approved the proposed development, subject to the preparation of a site management plan among other conditions. Depending on site management, and the characteristics of surrounding neighbourhoods, poorly managed big solar on landfill sites could become an environmental justice issue. From this perspective, residents’ concerns are understandable, and the City of Fremantle will need to ensure it carefully monitors construction. Infrasound phobia spreads … to solar energy cells! What’s next? It is reasonable to expect that cities will increasingly host large-scale solar installations. With careful site selection and management, the multiple benefits of clean energy can accrue to urban residents. Otherwise leftover or marginal land can derive an economic return. Of course care will need to be taken to minimise potential habitat loss or off site impacts such as visual intrusion, noise, and glare. But solar farms also have the potential to provide new habitats both via physical infrastructure (sites for nesting) and as part of site rehabilitation and management. Australia’s recycling industry is in crisis, with China having effectively closed its borders to foreign recycling. Emergency measures have included stockpiling, landfilling, and trying to find other international destinations for our recycling – but none of these are sustainable long-term solutions. To manage this problem sustainably, we need a mix of short and longer-term planning. That means taking a broader approach than the strategies agreed by state and federal environment ministers at last month’s emergency summit. There is a wide range of potential strategies to address the crisis, shown in the diagram below. We have highlighted those that were endorsed at the ministers’ meeting, but there are many other options we could be considering too. Waste management is planned around “the waste hierarchy”. This sets out our options for dealing with waste, in order from most to least preferable for sustainability. To be effective, the government’s strategies need to follow this established hierarchy. This means that waste strategies should prioritise avoiding, reducing, and reusing, before recycling, energy recovery, and finally disposal to landfill as a last resort. So how do the ministers’ strategies stack up? The ministers agreed to reduce waste through consumer education and industry initiatives. These types of initiatives are important and sit at the top of the waste hierarchy, but the announcement is so far lacking in detail and targets. Local councils have been running recycling education initiatives for a long time, with mixed success. Going beyond this to waste reduction is even harder and there are few successful examples. To do this well would require substantial investment of time and resources to identify and trial effective approaches to waste reduction. Education alone, without incentives and regulations, is unlikely to deliver sufficient change. The ministers also endorsed a new target of making 100% of packaging recyclable, reusable or compostable by 2025. While this target is commendable, we should be prioritising reduction and reuse over recycling and composting when designing packaging. The industry-led Australian Packaging Covenant Organisation (APCO) has already adopted “closing the loop” (improved recovery) as a performance criterion in its new Packaging Sustainability Framework, but incentives to prioritise reusable packaging are still needed. Refillable returnable glass bottles are common in Europe. Support from government and businesses for local pilots of these and similar schemes would help overcome barriers to implementation. These “top of the hierarchy” approaches are all long-term and need serious attention to reduce the amount of waste we create in the first place. While we’re working on avoidance and reuse, we need to improve our domestic recycling system. The ministers also agreed to work together on expanding and developing our recycling industry. To do this, we need to focus on improving sorting, and reprocessing recyclables into materials that can be used for manufacturing. The recycling industry is advocating for new reprocessing facilities, but we need to develop local markets for recycled material at the same time to make sure we depend less on export markets. For recycling to happen, there needs to be a market for recycled content. The ministers agreed to advocate for more recycled materials in government procurement, such as recycled paper, road base, and construction materials. Procurement guidelines will be needed to ensure this goes ahead. Governments could take this a step further, and incentivise businesses to use recycled content in their products too. Labelling products to indicate recycled content would also help generate demand from consumers. This is an ongoing challenge, but will be essential for any future recycling pathways. Initiatives to achieve this were not detailed in the meeting. This will require upgrading our sorting facilities, and potentially improving our kerbside collection systems too. Industry reports have suggested that re-introducing separate bins at the kerbside – or at least separating paper from glass – would greatly improve the quality of mixed paper compared with current co-mingled recycling. It would eliminate glass shards, which make re-milling paper much more difficult. Container deposit schemes also provide an excellent opportunity to collect better-value recycling streams. South Australia developed its scheme way back in 1977 and similar schemes are finally being rolled out in New South Wales (“return and earn”), and will soon be followed by Queensland and Western Australia. Labelling products with recycling instructions may also help with collection quality. Industry organisations APCO, Planet Ark and PREP Design recently launched a labelling scheme to help packaging designers increase the recyclability of their packaging, and to give consumers information on how to recycle it. Finally, the ministers also identified the potential to develop “waste to energy projects” through existing energy funding channels. This strategy falls lower down the hierarchy than recycling, as materials are no longer available to recirculate in the economy. Waste to energy projects can be complementary to recycling in processing genuine residual waste (contaminants separated from recyclables at sorting centres), to achieve very high levels of diversion. This is already required under the NSW EPA energy from waste policy. However, waste to energy is not a solution to a recycling crisis and should not be used to deal with recyclables that can no longer be exported to China. It is not a short-term option either, because Australia does not have a mature waste to energy sector, and investment needs to happen at the right scale to ensure that it is complementary to recycling. Most of the strategies currently being pursued are sound in principle, although many of them need clearer plans for their funding and implementation, as well as ambitious targets. We need a comprehensive range of short- and longer-term strategies if we are truly to get to grips with the recycling crisis. We should be wary of “silver bullets” such as waste to energy, or new export contracts that could undermine more sustainable long-term solutions. The environment ministers agreed to update the National Waste Policy this year, incorporating circular economy principles, which is encouraging. This will be their opportunity to coordinate a nationally consistent response that promotes the development of resilient markets for recycled content, and reusable and re-manufactured products. This will need to go beyond the current strong focus on recycling, and embrace the upper levels of the waste hierarchy. The next step will be to develop properly funded plans for implementing these changes. Furious debate around the role of trophy hunting in conservation raged in 2015, after the killing of Cecil the lion in Zimbabwe, and a critically endangered black rhino in Namibia. Together, these two incidents triggered vocal appeals to ban trophy hunting throughout Africa. While to most people (including us) this might seem like an abhorrent way to generate money, we argue in a new paper that trophy hunting, if done sustainably, can be an important tool in the conservationist’s toolbox. In July 2015 American dentist Walter James Palmer shot and killed a male lion called Cecil with a hunting bow and arrow, sparking a storm of outrage. Cecil was a favourite of tourists visiting Hwange National Park in Zimbabwe. Allegations that aspects of the hunt were done illegally added considerable fuel to the flames, although Palmer was not charged by the Zimbabwean government. Likewise in May 2015, a Texan legally shot a critically endangered black rhino in Namibia, which also generated considerable online ire. The backlash ensued even though the male rhino was considered “surplus” to Namibia’s black rhino populations, and the US$350,000 generated from the managed hunt was to be re-invested in conservation. The US government has endorsed hunting of black rhinos by allowing a limited import of rhino trophies. These highly politicised events are but a small component of a large industry in Africa worth more than US$215 million per year, “selling” iconic animals to (mainly foreign) hunters as a means of generating otherwise scarce funds. Conserving biodiversity can be expensive. Generating money has become a central preoccupation of many environmental charities, conservation-minded individuals, government agencies and scientists. Making money for conservation in Africa is even more challenging, so we argue that trophy hunting should and could fill some of that gap. The question of whether trophy hunting is ethically justifiable is a separate issue. While animal suffering can be minimised with good practice, the moral case for or against trophy hunting is a choice we must make as a society. Beyond the ethical or moral issues, there are still many concerns about trophy hunting that currently limit its use as a conservation tool. One of the biggest problems is that the revenue it generates often goes to the private sector rather than distributing benefits to conservation and local communities. It can also be difficult (but not impossible) to determine just how many animals can be sustainably killed. Some forms of trophy hunting have debatable value for conservation. For instance, “canned lion hunting”, where lions are bred and raised in captivity only to be shot in specially made enclosures, provides no incentive for conserving lions in the wild. At the same time, opposing sustainable trophy hunting could end up being worse for species conservation. While revenue from wildlife sightseeing is good, in most cases effective conservation requires much more. Without more funding creating incentives to conserve wildlife, many natural habitats will be converted to farmland, which is generally much worse for native wildlife and the entire ecosystem. Trophy hunting can also have a smaller carbon and infrastructure footprint than ecotourism because it requires fewer paying customers for the same amount of revenue. Trophy hunting can even generate higher revenue than the most successful ecotourism enterprises. Hunting can lead to larger wildlife populations because they are specifically managed to keep numbers higher. Larger animal populations are more resilient to extinction, and hunters have an interest in their protection. This contrasts with ecotourism where the presence of only a few individual animals is sufficient to ensure that the expectations of many paying tourists are met. Mandatory levies should be imposed on trophy hunting operators by governments. These can be invested directly into trust funds for conservation and management. Trophies from areas that help conservation and respect animal welfare should be certified and labelled. Populations must be analysed to ensure that killing wildlife does not cause their numbers to fall. Post-hunt sales of any part of the animals should be banned to minimise illegal wildlife trade. Priority should be given to trophy hunting enterprises run (or leased) by local communities. Trusts should be created to share benefits with local communities and promote long-term economic sustainability. Mandatory scientific sampling of animals killed, including tissue for genetic analyses and teeth for age analysis, should be enforced. Mandatory five-year (or more frequent) reviews of all animals hunted and detailed conservation plans should be submitted to government legislators before permits are extended. There should be full public disclosure of all data collected. Independent government observers should be placed randomly and without forewarning on trophy hunts as they happen. Trophies must be confiscated and permits revoked when illegal practices are discovered. Backup professional shooters and trackers should be present for all hunts to minimise welfare concerns. Can developing nations implement these strategies? Yes, they can, but only if the funding model is transparent and includes direct support from national governments, as well as mechanisms for oversight and regulation as we have outlined. Some form of regional and international cooperation might also be necessary to minimise the chance of corruption. Without greater oversight, better governance, and management based on scientific evidence, we fear that the furore over trophy hunting will continue – to the detriment of biodiversity, hunters and local communities. Adopting our ideas could help avoid this.